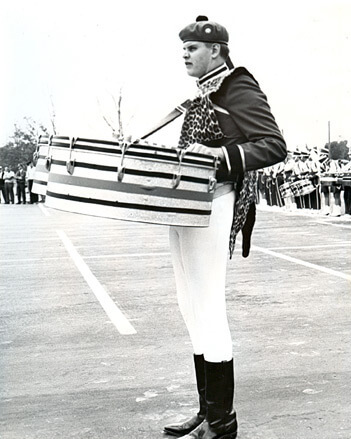 Matt Daugherty, a Cedar Rapids Emerald Knights/Nite Express member from 1969 to 1987, and current director of bands at Pembroke Pines Charter High School in Florida, submitted this photo and caption. Pictured here on the starting line is Michael Daugherty with the Cedar Rapids Grenadiers at the 1969 American Legion Finals. Daugherty is now the professor of composition at the University of Michigan. He has had several works performed by drum corps in the past including "Desi" (Blue Devils), "Niagara Falls" (The Cavaliers), and "Motown Metal" (Carolina Crown).